Prime minister Narendra Modi used the occasion of the budget presentation by finance minister Arun Jaitley to launch a “political psy-op”, to borrow a phrase used by intelligence agencies, to wear out the adversaries. Much before the next Lok Sabha polls knock the doors, the attrition in the opposition ranks begins to set in. Perhaps the opposition was expecting the government to make a few mistakes that can be amplified and turned into major political issues. But Jaitley treaded cautiously in his lengthy budget speech and made all kinds of right noises which will have greater resonance with the masses rather than pleasing hardnosed economists. What however took the cake was the government’s planning that encompassed the period well beyond 2019. It’s various infrastructure development programmes in rural areas and welfare programmes envisage the impact till 2022. The message conveys implicitly but unambiguously that the victory in 2019 for Modi is a forgone conclusion. Of course, such conclusions are surreal as elections are still a far cry. And in politics, nothing is predictable. That is the precise reason why this budget is a political psy-op – a stealth operation intended to rattle the opposition. And there is little doubt that it has singularly achieved its objective. 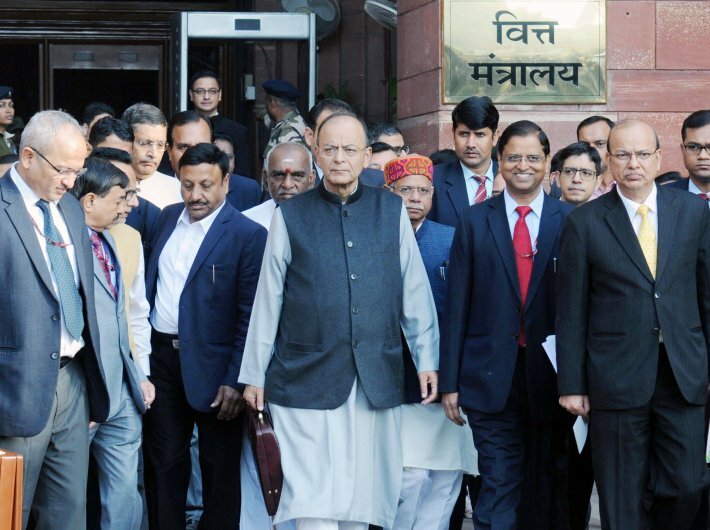 Just as Jaitley began his address and focused on the rural sector, the thrust of the budget became clear. In recent memory, there has hardly come any occasion when the finance minister talks about the minimum support price (MSP) for agriculture produce. Similarly, the marketing of the agriculture produce and linking to marketing chains was the least of the ingredients that the budget is made of. Yet Jaitley insisted on raising MSP and providing easy marketing facility to small farmers. The creation of institutionalised mechanism and construction warehouses were emphasised as the focused agenda. The promise of a universal health scheme, covering nearly 55 percent of the poor and lower middle class, is quite akin to launching the Jan Dhan scheme. The usual question would arise: how will the government do it? From where will it get money? But the successful implementation of the Jan Dhan, Ujjwala, Ujaala and various such schemes has belied the lower expectations that we have from our bureaucracy. On the contrary, they all proved that the bureaucracy shows incredible performance if it is given a defined task. There is no doubt that the world’s biggest health coverage scheme would run into many road blocks on account of funds, acute shortage of doctors and decrepit conditions of hospitals. In former finance minister P Chaidambaram’s words, it can again be a “jumla” (rhetoric) with no connection to ground reality. Ironically enough, this “jumla” may find greater resonance among masses than erudite exposition on economics by Chidambaram and his ilk. Look at the manner in which the basic facilities like provision of cooking gas cylinder, toilets, banking and electricity were beyond the reach of common people. Now there is a race among states to provide these facilities to the poor. True, there could be many lacunae in implementation of these schemes. But there is no doubt that these facilities are given as entitlement of the poor and not as doles from the government. In this context, a genuine question arises: Why did it take so long for people in the government to recognise the problems of poor and initiate remedy even in the form of a jumla? Similarly, the budget has taken cognisance of urbanisation that is spreading to rural areas and promised to give a thrust to rural housing. Aware of the growing number of people in the ‘neo-middle class’ that aspires to living standards of relatively high-income middle class in urban areas, the move to build new smart cities is clearly intended to develop satellite townships with the objective of an even spread of urbanisation across the country. There is no doubt that a political budget was very much expected before the election due next year. And nobody knows better than Modi that good politics is only good economics, irrespective of whatever profound scholars of economics say. His own experience as Gujarat chief minister has confirmed this prognosis. In today’s budget, he rattled his adversaries by extending his agenda much beyond 2019 when Lok Sabha polls are due. That’s why this budget is a political psy-op to keep the opposition perpetually guessing about his next moves.